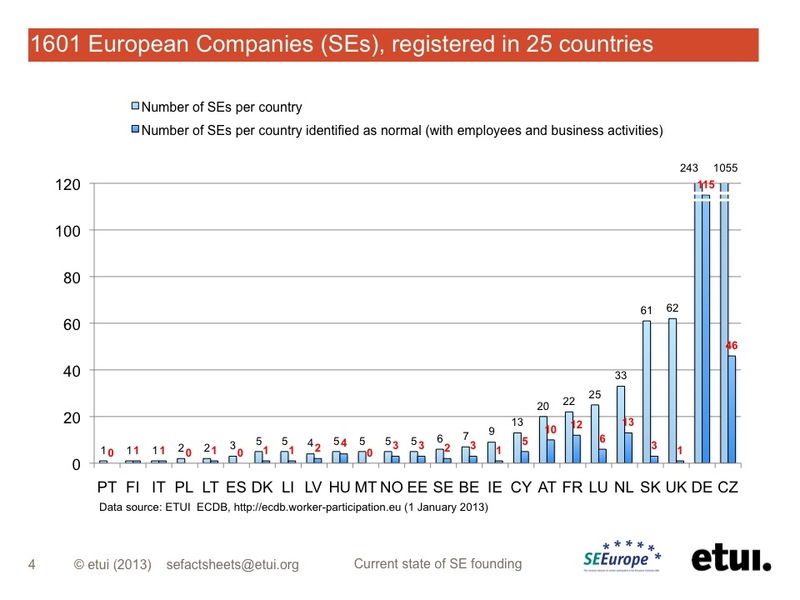 The dynamic of establishment of SEs speeded up a bit in the last quarter of 2012 and therefore 2013 started with 1,601 registered SEs (175 more than at the time of our previous SE News, 1 October 2012) in the ETUI’s European Company Database (ECDB). As usual, by far the most companies were registered in the Czech Republic and a few more in Germany, Slovakia, France, Denmark and Cyprus. New companies: 7 normal, 2 empty/micro and 173 UFOs. The Czech practice of ‘SE mass production’ is continuing (at least 156 SEs within four months). The total number of SEs in the Czech Republic is now 1,055. 1 company moved its registered office from one EEA country to another. 6 companies were deregistered from national registers (for example, due to bankruptcy) and one transformed into a national legal form. As before, 25 European countries host European Companies (Bulgaria, Greece, Iceland, Romania and Slovenia still host none). In addition to the already registered companies, the ECDB currently provides information on 11 planned SEs (four new planned SEs on the list).